Which? Water rights or a Spring House? On the farm here, there was a tiny little rumour that there was Water Rights. Which are worth gold if you have them. If you have grandfathered ones, they are Platinum. ONE reality agency had it listed with water rights for about half a day, but I remembered seeing it before it disappeared when all the rest did not mention it at all and when we asked our realtor he said he did not know. I left it at that for then, suspecting I could find it later if there was one with less kafuffles. Although I thought it would take alot more to find it than a couple of hours on the net. I thought for sure it would take a few trips to the county or state offices and the Water Master at the minimum. Each state has different laws. I was vaguely aware of mine in Oregon as alot of my friends growing up were on century farms of the same era and kinda where to start looking. I also knew the farm was old enough that someone long ago probably did file for water rights as it was 'all the rage' then (if you will). You will need your Township, Range and Section for a start and the probable original person's name who you suspect filed claim on the water. And in my case I had to wade through alot of old old old grainy certificates and maps. I knew the lay of the land here, not quite as well as the back of my hand, but a working knowledge and BINGO.. found it. I was grinning like a Cheshire cat. On the Spring House, there are different ways to do it, from a seep to a running stream. I will be working with a running stream and a partial diversion from the dam for about 8-10 feet? I have to go with what was permitted for back in the 1930's. It is permitted for 200' of diversion. But like I said, the system worked for almost 80 years, so I like tried and true. I actually went to bed early last night, but I found this awesome vid by engineer775 about developing raw springs before I slept and I watched it this morning. There are several parts, but this part is giving me good ideas for the springhouse and I think I can make these parts from things I pretty much already have here, spare stuff left over from the farmhouse dismanteling and rebuilding. I am also going to the library today to pick up a book I own, but have stuck away in storage. I have not been able to get much done on my 13Skills recently in managing and building the farm,which has been a 14-16 hour job 7 days a week and caring for my 3 year old who is an awesome trooper. However, I got my 'driver's permit' last Sunday. One of our wonderful TSPers here at the forum owns a draft horse team and was doing an event last Sunday. Months ago he invited me to come help him at the event and learn how to hitch and watch the team work. I was talking to our TSP member (he might pipe up and say who he is if he sees this post) in email about hitching two horses up together a few months ago. I have driven singles, but after looking at our harnesses I was mystified as how to hook the two horses together. So I went and was excited to learn. My fellow Oregonian invited me to come to AgFest 2013 and help with his draft team and learn more about working draft horses. I have been a bit mystified as how to hitch two together and I am usually quite good at puzzles. Again, I have driven singles, but never a team (a bit more about the mystification in a moment). I wanted to learn for our draft horse team and their harnesses so everyone was happy and safe. So I arrive at the Oregon State Fairgrounds to meet "r" and get a chance to work with a draft horse team giving rides to a couple hundred people over the course of the day. The morning started out with giving the horses a bath. They have white/grey coats, so after rolling in the arena the night before, a bath was in order. The pair is named "Dan" and "Saucer" who are a pair of Percherons in their early 20's. They have been carriage horses all their lives, not logging horses like ours. "Dan" who is the horse in the photo getting a bath, loves to play in the water with his lips. Sometimes he will splash the bather back too. After their bath I got to walk them back to their area and brush out their manes and tails. I am almost too short to get their forelock. Thankfully they both lowered their heads for me to a bit to be accomadating. They are really gentle giants. The Percheron is a breed of draft horse that originated in the Huisne river valley in northern France, part of the former Perche province from which the breed takes its name. Usually grey or black in color, Percherons are well-muscled, and known for their intelligence and willingness to work. Although their exact origins are unknown, the ancestors of the breed were present in the valley by the 17th century. They were originally for use as war horses. Over time, they began to be used for pulling stage coaches and later for agriculture and hauling heavy goods. (The breed I have at home are Clydesdales). Then after waiting until the appointed time, we got the boys harnessed up. It did not take long. Less than 10 minutes per horse. I learned the finer points of how to store a harness, how to hook it when not being used so it is easy to put back on after use, the parts, how to put it on a horse. For instance when we put the collars on our horses, we unbuckled it, but you can turn a collar upside down to slip it over the horses head. I also found out about the "Y" on the driving lines and why one is shorter and how to hook the lines through the ring between the horses. Also found out why I was mystified on hooking them together. I forgot the actual name of this piece of harness, but it attaches to the yoke, but I am pretty sure our harnesses are lacking them. I will go double check when I get a chance to go to where we store our harnesses at the farm. So if the "Yoke Straps" are not there, I was not completely losing my mind after all. I asked Z when I showed him this photo and he does not think there are any of these 'yoke straps' attached to the harnesses either. This is the part I seem not to have on my harnesses and why I could not figure out how to hook them up together. Then it was time to hitch up. "r" took the wagon to the horses, VS the horses to the wagon. Depending on the circumstances, it can be a bit easier. The wagon holds about 20-21 people and we took a couple hundred people around, some of which this was their first experience with farm animals, let alone interacting with one like this. About three kids got to sit up on the front bench seat with us on each trip. I sat up next to "r" to learn how to work them and I think maybe I did not ask him as many questions as he was thinking I would, but I was absorbing almost everything he was telling me in. We had a route that went about 20 minutes from loading people up to the place we unloaded them. The route usually took us under a large metal sculpture. It did not even phase the boys a bit, but neither did the steam engine whistle. They are pretty unflappable. I was perfectly comfortable working in close proximity to them or right between them when hooking them up, even if I did not know them well. I am not usually like that with animals I do not know. We stopped them a few times and gave them water and then lunch. "Saucer" did not usually drink very much. "r" warned me "Dan" might splash me, being the water loving guy he is, but he was a gentleman and refrained. I was able to drive them twice today. On the way to give them a break at lunch and then again when we were done for the day. The first time I did not grab forward enough on the lines (if you don't, you have no extra room for pulling back) and then I cut a corner a bit close (due to having too much line out, but glad I did not wipe anything or anyone out). You really do have to grab out alot further on the lines (the proper name for these long reins) than you think to keep good contact with the horses mouths. When the horses are moving, you need to keep some pressure on them or they will break into a fast trot. It is pretty fine to be flying along with them, but not when there hundreds of people in your way. I like that the lines feel alive in your hands and you have 2,200 pounds of horse connected to you through the same. "r" said they probably wouldn't listen to me as they are used to him driving, so he called out the commands, such as "Come Gee", "Yup, Yup, Yup", etc, but I still did, as it is habit I guess, from working with various animals and my sled dogs. Felt weird not to. OMG, I am actually driving!! In public yet! After getting them unharnessed (and I got to learn more by unharnessing), letting them eat hay, drink water and roll in the dirt it was time to part ways. I had a wonderful learning experience and I thank 'r' so very much for this opportunity and entrusting his partners to me. Being that it was 20 degrees warmer than normal today and Z got off work earlier than usual as he went to work earlier than normal.. we decided to walk to the headwaters of our creek or the property line.. whichever was first. Everyone put on boots as we figured we would walk the creek down to the farm even though we figured we needed to crawl through brush now and again. We walked the flagged property line through the brushy thick brush and over hill and dale, down a very steep bank and found the creek. I would like to say I found it gracefully, but I slid down the slippery bank on my rear end and ended up IN the creek. Z and SweetPea laughed at me and my muddy bum. Since I was IN the creekline, I climbed out on the opposite side and I went back upstream on the bank a few yards and found where the creek started for us, which oddly is RIGHT on the property line (at this time of the year anyway). We thought it would be further up where it started by 1/4 mile. There is about a 2 1/2-3 foot drop of water and it sounds all bubbly and waterfall-like into a 2 foot deep pool, it doesn't have the right effect in the photo for size, as I am standing up on the bank aways as I did not want to fall into the creek again. I know.. wimp.. In asking Z, we figure it might be 15-20 gallons a minute at this part of the creek. We did not bring a bucket however. We decided to try down at the dam at the farm. At this point we are at the Lodge property which is above the farm. I am sure in the winter months it is more than a seep above where this lovely little waterfall comes out of the ground into the pool. Across the creek is a bowl out of the hillside with what seems to be another spring coming out and trickling down to the main creek. If it was not so brushy, skunk cabbagey and wet, it would be a nice place for a picnic. After going and seeing some more sights along the way (some not so good, but that is for another post.. or not) and ditching the creek for the old slid road on the south side of our property which is up a STEEP 50+ foot 45 degree angle climb out of the ravine. We made it down to the dam area and tried to get a bucker under, but it was not working. I will likely go down this weekend to the waterfall before it goes into the river and time it there. After Archer talked to me about hydraulic rams on TSP, I mentioned it to Z and now Z is all over that. We will use it to water the farm garden we think. Food Storage — Spring House - Project started. Spring House on our creekline where we have water rights. It so looks like there is a foundation for one on the creekline at a natural spot not too far from the heritage house. Until 1970, they used the creek and finally a hand pump next to the lilac bush for water. I would like to restore a springhouse if there had one previously to preserve the ambience of the century old farm. I did more research on our creekline, studied the Water Rights from pre-Depression Era days (it tells how the dam was built actually) and weed eatered the area free from 5 foot tall Horsetail and Braken ferns, so I could see what was happening in there a few weeks ago. I pulled some sheet metal and such out of where the dam/creek is, (looked like kids put it in years back maybe?) and got a bucket under the flow. At the driest part of the year, it is still giving 5-8 gallons per minute. Since then, I talked to my friend Bob who is a geologist and I ran my ideas past him to see if they were plausible, while he was here. Yesterday I talked to my friend S who is an OSP and I was teasing him that I found the perfect rock I want for the springhouse alongside the road from a slide, but it was on a crummy corner and I required him to block the road for me with his police car so I could safely get it. He told me to call the county and they often will pick it up and haul it to you. So today I called 3 phone numbers, each one getting me closer to the guy I needed to talk to, and they are sending me a form to fill out and they will go collect my rock I want and dump it here for me. Apparently they do look for closer places to haul rock than back to the county/state road shops. Before I was off the phone, the email came through for info on it from the guy I was talking to on the phone. I was in our Lodge well house today and I want the Springhouse to be about that size I think. I just went out to measure it and it is 7 feet wide, 6 feet-ish deep and 5 feet tall against the back wall, 7 foot at the front where the door is. I could make it 6x6, but I think I will like that extra bit for shelves and such. 12" thick walls from stone, so the interior will be a bit smaller than the 7'x6', although I may change that to 8'x7' depending on how much rock I receive. This rock I have had my eye on is a orangey-grey coloured rock, so it would be difficult to just match from the next slide down the road. Part of my requirements for this project is that is has to be local stone. Spring House on our creekline where we have water rights. And we did build a hydraulic ram since this last post. The hydraulic ram will lift the water up to the garden and not even use any electricity. They are really simple and ingenious machines. That +1 should go to Z and SP actually. I did not do much on this project. I'll go look for his login and give it to him then... Does he have a site/link with the plans he worked off of? I might go build one just to see how to do so so I know how to do it. Here that it is halfway through 2014... I still have not given up on the 13-in-13. Sometimes it just takes me a little longer to get something accomplished when other things have taken priority. We are always doing 'prepping' type projects around here, and the ones I chose were large tasks to accomplish. I knew I would likely not get them done in a year's time, but they were still goals I would like to finish in the next few years. So where I am at now. Got to drive the team a TSPer generously allowed me to do. Still looking for a work collar to fit "Whiskers", but I have a buggy harness which has a breast collar on it. Been driving him around with that to smarten him up. Still not trusting this horse yet. He still has poor ground manners. Granted, I could be working with him more on them. I am wondering if this is why he was dropped from working as a logging horse. If it were up to me, I would consider selling him and getting a new one. He is a nightmare to worm. Z has built him a sledge to pull as soon as we get the work collar and get him to work on something and maybe that will chill him out. I may put the harness on him today in fact. I know I need to do it more often than I do, but once we have the work collar, I can see me utilizing him on a daily basis, even if he is slower than using the tractor or the quad. I want to have him in 'working order'. Don't worry, we had not finished harnessing him up yet.. That one line is really short and it kept slipping through. Managing, using, conserving, and repairing forestland. I am currently learning about how to selective cut for the health of the forest. How far apart they should be. What to look like in culling individual trees as well as which ones are going to gain more worth over the years. We have bought a 'portable' sawmill to cut our own lumber and are in the process of designing a permanent mill shed for it built before Autumn. I will not allow either of us to actually cut trees larger than 'poles', so we will hire someone who does this as a living (we have lots of loggers around here), to drop them. I have identified at least 3 more types of trees in our forest this year. Beer Making — At a standstill. Alot of projects on the the go and this one is a low priority. Z and I took classes at Oregon State University on this. I have AI'd various other animals at the vet clinic as part of my job in the past. But we have since bought our own Berkshire boar, so we have not had to AI our sows. But we have the knowledge if we need to attempt it. So far our sows have produced us four litters. It needs to be on standby until I have my 600 sf log cabin studio to use as my teaching space and office. I have two floor looms, and they are not just a small piece of furniture to set up in the house. In the pic, the log building over the concrete basement is my studio. With the help of my WWOOFer who is coming, perhaps we can tear off the siding over the logs on the South-ish side of the building. Get the three windows in it, the large picture window over looking the south side, and two windows which open on the creekside. Maybe this summer we can start to chink it, put the rock in the wood cookstove alcove and get a little further on it. Someday, I would like to rock over the concrete to dress it up. The bottom part will eventually be our farm store. Hydro power (pelton wheel) but I think it needs to wait on the Spring House being built. Spring House on same water source as above. A spring house is practical for me to store extra produce from the garden, extra milk/butter from the cow. I have been in spring houses before and if the electric does go out, they are just about as good as a refrigerator. Not to mention pretty nice to hang out in on a hot day. I have a WWOOFer who is coming to stay with us. She is the mother of a TSP member from Texas. And I believe she would like to get into this project with me. Part of the reason I have not done this project yet, is I have a window of August/September/October when the water it at is lowest and I missed that window last year. I also need to go scavenge rock, and if I am going up into the mountains to get it, I want a partner to go get it with me. I have contacted the 'local' ham group a few times and they keep telling me they will have classes soon. This is something I really feel like I need to actually sit in a classroom and be taught. I have set up five water catchment systems (there are 5 of them, but 4 are for watering livestock). One of them is a 55 gallon drum for human household use when the power goes out. 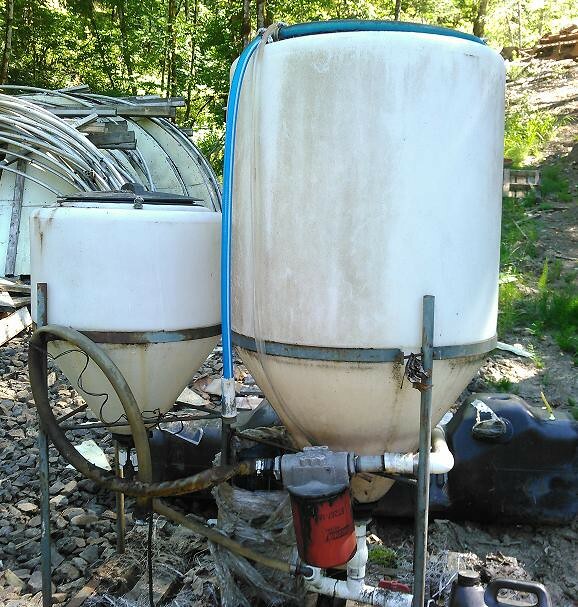 I want a larger system, either with more 55 gallon drums or a 227 gallon IBC tank system. I would like to catch rain from the roof of the North Barn and pipe it down a a huge bank of IBC tanks for the greenhouses. I want to base it off a system that was used in the 1860's in a historic town in northern BC. I would like to put a spiggot on the bottom of the one we use for household, but I think I wouldlike to move it over a bit and put it on a concrete brick pad, but I want to put it right where I need to put in a 'foundation' on the backside of the woodshed. Bio Fuel — Nixed, but still learning about it. I have had an interest in biodiesel and would like to try it even small scale to see how it is done. There are a few guys in the community running their large trucks on SVO and I stuck my head under their truck hoods last week and learned what they had to say about their trucks, their pre-heaters and such. Learn basic electronics, like build a radio from scrap like they did in WWI. This goes back to my 2012 New Years Resolution for learning electronics. My brother built a small radio when he was in 4-5th grade and I remember it working quite well. I know during WWI they used scraps off the Jeeps to make radios for the trenches. It fascinates me that something so useful can be made out of so little. I would like to know the knowledge on how to make one. So for entertainment, learning and one day could be security. This will be a winter project I am sure. So likely I will attempt it again in Winter 2014/15. And get SP involved in it too. Education — Economics - Still working on it. Learn basic economics better than I have a grasp on now. It is more of a bit of a read here, a bit of a read there, rather than sitting down with a college economics book. Oh gosh those draft horses are amazing. I would be lying if I said I wasn't jealous . What a fabulous fun skill to learn. I might have to ask DH if I can learn LOL. For the last week, I have been ground driving "Whiskers" daily as he had been on 5 years too long of a vacation, between the last people who owned him and then us for the last 18 months. He was getting obnoxious from not having a job to do and getting pushy. We have done 6 miles in the last few days, I am getting out there first thing in the morning after SP wakes up and we do two miles on the forestland next door, which once was part of this property. The ground is easy on his bare feet, there is no traffic, unless they are doing active logging up here (which I don't think they are currently) and since he is a ex-logging horse, 12 year veteran, I figured he would be comfortable in that setting. This video was taken yesterday morning on my morning 'walk' with "Whiskers". Sorry about the third part which is turned sideways. But this is what it looks like in general our neck of the woods. When I said "we used to own this part", I actually meant that the land we were walking on USED to be attached to our land. We never owned it, but the previous owners did. This used to be a HUGE parcel. SweetPea also asked how come we did not do this when she was three years old, and I told her she would not have been able to keep up with a horse when she was three years old. But I do plan on going on longer treks with him ground driving, and she should be able to ride him with her helmet and hanging onto the hames. I will try to do a better video another day, but it really is difficult to drive with a line in both hands and run a video camera. I did not run the lines though the bridle either, as I really need the bit more length that it gives me. In just a few days of driving him daily and getting into a routine for the both of us, he has calmed down and seems to be enjoying being harnessed up and going for a walk. It takes 12 weeks for a human and an animal to become good working partners and know what to expect from each other. But yesterday was even more progress. Yesterday I bought a Pioneer forecart, already set up for draft horses, for 'Whiskers". The problem is it is in Wisconsin currently, but eventually it will make its way out there. The two pictures below are of my cart, parked in front of my friend Bob's shop after he went to go pick it up for me. There are extras included with it, which are not shown in the pictures. One of the extras was a work collar. One thing which we have been missing from "Whiskers" large work harness. We are not sure it fits yet, but my friend will ship it out UPS so we will get that before the forecart. But all-in-all, it is forward progress. There are places you can learn. Or find someone to mentor you. If it gets here before you get here next time, I will take you and queue for ride. Chem 'made' me look to see where I am on my 13 in '13. And re-evaluate. I don't care that it is the end of 2014, just like on my other post.. I will just continue to plug along on it. I can hitch up a horse, figure out how to put a harness back together, I can ground drive, and I have driven a large farm type waggon. I consider this still in progress, even though I can get the 'job done'. It is an art and every time you change working partners, even if it is an animal, it takes 8-12 weeks to work as a well oiled machine. However, I am looking for another partner. Currently I am looking at Rescue Drafts, and looking into mules. I have always had a thing for long ears and since SP has donkeys, getting another long ear will fit right in. "Whiskers" our Clydesdale is getting old, has no teeth and it is hard to keep weight on him, and he is refusing to lift his feet for a farrier. Whether this is obnoxiousness on his part, or he is in pain (common in older draft horses) from lifting his feet, his feet cannot be done unless we throw him. Even this summer, on full pasture, he was on 9-18 quarts of Senior horse diet a day, and he is still ribby, and losing muscle in his hind legs. We may have to put him down this winter. Managing, using, conserving, and repairing forestland. I have actually learned alot since my original post. Most of my neighbors are timberworkers of some kind and I pick their brains alot. We have started thinning our forest. Evaluated it, and have done Added Value projects in it. Been building alot of things, although Z won't let me tackle a job on my own. I do get lazy as he can do Trig in his head and I cannot add 2+2, so it is easier having him as a walking calculator. Beer Making — In Progress and not gone forward one step. Still have not gotten to this one yet. I still have not set up my large looms yet, but I have been working on the smaller ones and teaching people as well. We keep wavering on which direction to go, or a hybrid. A little further along, but I missed my window in August when the water was down. I signed up for class in February and got 2 of my fire team, 1 TSPer, and my person I am mentoring signed up as well. We are soon adding three 1,000 gallon+ water catchments. One will be for the well, so I that is not really catchment, but it is storing drinking water. The other two will be set up for water catchment off the North Barn and carried via pipe from the North Barn tank, down the hill to the Greenhouse Complex tank for watering the greenhouses. Overflow and drains to keep the tanks/pipes from freezing will go to our ravine creek and then to the river. Nixed. But there is a guy I see every Wednesday and we have talked a long time each time about his BioFuel truck as we sit on his or my tailgate. So I have learned a fair bit from him. At least a working knowledge. So I learned, but decided not to do for many reasons. Learn basic electronics, like build a radio from scrap like they did in WWI. I plan on doing that this winter, when it is grody and yucky winter weather and I would rather be near the woodstove. Education — Economics - In Process. Learn basic economics better than I have a grasp on now. I have upgraded this to 'teach a donkey to drive' goal. "Whiskers" our Clydesdale is no more. And I have been looking at a new working partner for a year maybe. I looked out the window one day while I was thinking about it and spied the donkeys down on the field. "Tilly" is my new victim, 'guinea pig' project. And she seems to have a willingness to work. We put the packsaddle on her again with panniers and went on a 4 hour walk yesterday. The 'rigging' for the packsaddle is pretty much in all the same spots as a harness. It has a breastcollar (not a work collar), breaching, things here and there.. and even grabbing her tail and stuffing it through the breeching, she does not mind. I just take it slow with her and let her check things out. Donkeys are different than mules or horses, something I would have not believed until I was working with one daily. Donkey's are not stubborn.. well.. yes.. but no.. they have to check things out, study the situation for a bit and determine it is ok, before they are cool with it. They don't always take your word for it, they want to check it out for themselves, which in alot of respects in life, is probably a good idea. Where the stubbornness comes in, is the human getting involved. The human is in a hurry and wants to hurry and wants the donkey to hurry up, which makes the donkey wary and plant its feet stubbornly. Which is why donkeys get the label of 'stubborn', when it is in fact the human that actually starts it. So don't push, pull or do anything to the donkey before it decides the situation is alright. When donkey's are spooked, they tend to stop, or if they do bolt, it is like 12 feet, they stop turn around and stare at the thing which scared them. Unlike horses and mules, if a donkey has a threat.. it doesn't run away from it, but tends to shove into it, or stop it, which is why they are good guardians for sheep. They will run over and stomp a coyote. They are also horribly playful.... which is good, if you can turn that into something fun and productive. It takes about three times to suggest to a donkey what you want it to do, but when they learn it, they do not forget it. So I have to make sure I am (and Z is) consistant each and every time. I have two harnesses to try out on her. One is a nylon one, that I just got, which I think is too small, but it has the blinkers and two sets of lines. I have my horse or cob sized 1800's doctors buggy harness and I have it on the floor in front of me to move buckles and such to see how small I can make it (as soon as the woodstove warms up enough I can feel my fingers). I do have black nylon which is the same thickness on a reel, so I could modify the nylon harness if it is close. If not, the tack sale will be coming up in a few months. So yesterday I wanted to see how 'bombproof' "Tilly" is. We were walking past a blue plastic tarp on the ground, and I walked her over it.. and then 10-15 minutes later, I hung it on her withers, neck and ear. She stood. She looked like "Excuse me, that thing is cold and wet! ", but she never budged. I talked to her former owner yesterday (and showed her pics of the walk with did with the donkeys yesterday) and asked if she had 'sacked' them out. She said she had ten years ago, but has not messed with them since about that time. So if it stops raining between now and this coming weekend, I will be fitting "Tilly" to a harness (or the other way around) and see what happens there. If none of them fit, I will have to order another one in, or wait until the Tack Sale in the spring. I am tired of studying for a bit, so I think I will attempt that leather harness now. I see that Whiskers is no more but I seemed to miss of what happened with Cody? Very cool that you are working with draft animals, we have plenty of Amish here in the midwest who are experienced with working animals. Good luck with trying to get a hydro plant going. We do not know a lot about "Cody's" history, other than he was a logging horse in Oregon most of his life. He came into our lives in January 2013 and was a pasture buddy to "Whiskers". I had a photo of him in his prime in harness with another horse pulling logs out of the Oregon Coast range. He was GORGEOUS in his prime and working. I know he had heart to the end, prancing his high leg action only a few days before we put him down, that it seems only Clydesdales can do with all that feathering on their legs. I know when I harnessed him up last September when we were considering purchasing "Whiskers", I tossed the collar and harness on him, although I was not too interested in him at the time, but you could see his eyes light up and he really wanted to go to work and he drove like a dream. He was the sweetest horse ever (unlike "Whiskers"). At 30 years of age, he was starting to fail even with having his teeth done. Basically he had no teeth. Even with special feeds, and on full lush pasture he was dropping mass amounts of weight at the end. It was time to let him go. He is buried at the farm. Even though we did not buy him, he came along as a friend to "Whiskers", a bonus....I am glad that in his last few months he had a good retirement with a good friend on nice green pastures instead of a drylot where we found him. May there be 'good pastures' where he is now. "Cody", thank you for all your years of hard work for all us humans. I wanted to see where I was at on this Challenge since spud got me into this thread again. I am no longer at the former-farm, so some of my abilities to do some things have become more difficult, while other things have become much much easier. Animal Husbandry — Learn how to drive a draft horse team - ACCOMPLISHED, but ongoing forever. It is a skill you will always develop and learn, and with every hitching up you learn more. And when you partner up with a new animal. Still in progress, as it is not a thing you can just learn quickly. Currently I am helping friends plant thousands and thousands of Douglas Fir on their clearcut, although they might hire a crew soon to get it done. I am learning more about replanting, what trees are available to qualify as 'forestry', how to manage small woodlots (under 25 acres) and Christmas tree farms. Beer Making — DECLINED and culled out. I do not drink and I am no longer together with the person I was doing this for. I always have some project on the go, so this space will quickly get filled, if not already. Even though I never AI'd my former hogs, I have AI'd many species in the veterinary field over 20-some years. I took a day long class at Oregon State University on Swine AI, so I feel I can do this with confidence. On standby, but I recently went to the Mission Mill Museum in Salem, Oregon. I actually learned alot there. I actually do know how to weave, but I wanted to gain more skills at it. Hydro power (pelton wheel). The family I stay with at times, has many creeks coming down their steep mountain. I teased one day that they ought to get a pelton wheel. A week later three pelton wheels were delivered by the Mr. UPS man. We will be building a powerhouse here, and I will be helping set them up and learning. I have also been running a small solar system since August. The man of this family used to install alternative power, so I hope to learn alot from him. Food Storage — Spring House - Nixed.. I am no longer at the former-farm, so for the time being this project is on hold. One day I will build a springhouse somewhere, even if it is not for me. Communication — Ham radio license - ACCOMPLISHED Passed my Technician ticket last winter. Water Catchment/Filtering — ACCOMPLISHED and ongoing. Last summer I took a class through SAGE and built a 55 gallon water barrel. At the former farm 10,000 gallons of water catchment was put into place. I will soon have another water barrel system for water catchment and usage. The people who I stay with at times, they have a mountain spring watering system for their home, and I want to help them build a 55 gallon filtration system for that spring, since pine needles, discoloured water sometimes happens when it rains too hard. They are open to that idea and we will work on it as soon as other projects are out of the way. I borrowed a friends truck for a couple weeks, and it runs on biodiesel. I quipped that he ought to look into making BioDiesel and he went out and bought the equipment for it. I am studying up on how to make it with this equipment, so I can learn how to make it and teach him/his family. Learn basic electronics, like build a radio from scrap like they did in WWI. A friend and I did build a Foxhole radio. It did work. With me having my Ham Radio license now, I am on to catching 'larger fish'. I am figuring out an angle on how I want to proceed with this, or if I am already doing it. How have I missed out on this thread??? I am still working on it.. Mom thinks I am a procrastinator, but I think all things in their time.. Possibly making biodiesel for Z's truck This one might be nixed now since his truck half died. However, when it gets towed to the garage at the farm, I will be tearing it down to see if we can fix it. I used to work on lots of quarter mile cars for the racetrack, but never diesels which were not semi trucks. So it will be a bit of a new thing for me. I have had an interest in biodiesel and would like to try it even small scale to see how it is done. So it has been sitting awhile, but the people I stay with from time to time run diesel trucks, a year and a bit ago I quipped we ought to get a biodiesel system and make our own. It was not salvage, but got it for a good price, and since the friends paid for it, it is up to me to do the learning on how to do this.. so today I am learning, reading, watching videos now that I am back indoors escaping the heat. Here is part of our system. I think this is the waste oil tank and the methoxide tank you see here. The other parts are 'hidden' somewhere else on the farm here.